This is a really neat little title that features in movie footage from the feature by the same name. Now I have not seen this movie as yet but if what the game shows is anything to go by, I would say that we are in for a real treat. What the story revolves around is little Arthur and the adventures that he gets up to in the invisible world. You see, his grandfather was a great storyteller and treasure hunter and when Arthur is shrunk down to teenie tiny size he finds a whole world that exists without us knowing. This game is slated for a Jan release and the movie to come out about the same time. Having finished code in our hands for the PS2 was pretty neat to have this far in advance but I did spend a bit of my time thinking what the heck is going on, not fully understanding what the movie was fully about. 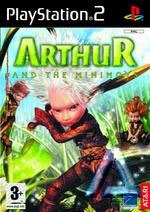 The title is based on a French series called Arthur and the Minimoys so you can check that out if you want to know more. The game does its best to get you into the swing of things quickly enough, although I did find the instructions somewhat tiring, though that is tempered by the knowledge that they are trying to teach kids how to play the game. Once you get going though, it is very easy to control and your character can do pretty cool things. You get to play as the three main characters and you can swap between them at different parts of the game to take advantage of their different abilities. This is a really neat aspect to the game and you can get them to actually carry out activities whilst the others defend them or carry out different tasks. This is cool beans. 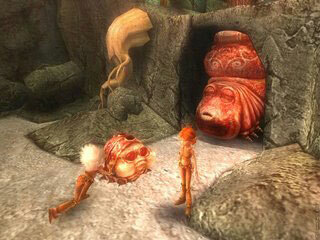 Graphically the game is a real treat to look at and reminded me in more ways than one of something Henson would do. Jim Henson that is. There is a sort of incandescent glow to the game that is appealing and the actual characters themselves look really cool. The way the game shows you just how small Arthur is works well and the scale of the normal objects are absolutely insane. Featuring a swag of fantastic platforming combat action, and some delicious puzzles that even adults will have to think about, Arthur and the Invisibles is a game that should delight the whole family. It will be interesting to see how this title fairs in the market place when the movie comes out as I think that parents will buy this game based on how their kids react to the flick, however if you are reading this review before the movie, buy it with confidence.